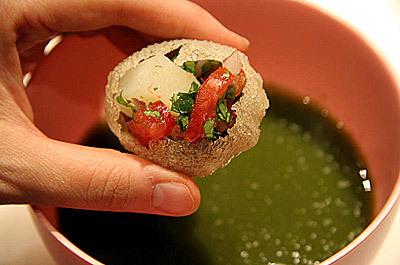 What is it with Panipuri and my loyalty towards my favorite street food? Then Delhi gave way to many changes and complimentary Paani.<*tears of joy and extra mirch!*>. It didn’t take long before my “what-a-cheapo!” gaze soon turned towards myself saying “What-a-dumbo” who doesn’t ask for her birth right. Her complimentary dirty green paani. Those hot sunny days when every molecule of the body threatened to evaporate, ice cold Singla paanipuri kept my sanity together. Delhi’s paanipuri has surely won my dil forever. Rates have changed but my little ball of surprise is still a spicy, tangy, non sweet Salsa for my tastebuds. I say ‘surprise’ because filthier the place, tastier the puchkas. ;) I have spent 4 years in Goa and panipuri followed me there also in the nooks and crannys where even hutch dog couldn’t claim to.